Posted 6:45 pm by muni & filed under CSS, HTML5, JQUERY, MYSQL, PHP. Everyone likes to make some hello world application, here is that type application you can make it youself. 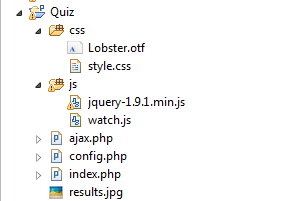 I am going to make Quiz application using PHP, MySQL, HTML5, jQuery, Ajax and CSS3. Just follow this tutorial to make it this appliaction youself. At the end of this tutorial you are going to have nice working your Quiz Application. Here is the folder structure of the application. Create a table for your Quiz application using following SQL Queries. Now insert some sample data’s in it. Create config.php file to write database connection at one place. Now create index.php file, and include config.php file at the first. now html part. I added stylesheet in the head section and h1 tag in the body. Next query through the database to get questions and answers from the database. Using that data’s we are going to dynamically generate form fields for all questions. now using jQuery i will show only one questions at a time.Here is jQuery script. At the end final question I am posting all the answers to ajax.php file using ajax to validate right, wrong and unanswered questions. Finally create ajax.php file that’s going to validate your answers.